Amara has been under the weather for the last few days and since her Mom had to go run some errand yesterday Grandma Kc got to go over and babysit! Amara wasn’t so sick that we couldn’t have a little fun coloring and reading — just to sick to get very far from home! While I was there I went in search of a new book to take home as they have jillions! I picked up a framed picture of Amara from the bookcase and it brought back this memory. Whenever Amara spends the night I always have to read her a story and then I have to tell her a story. One of the fun variations on this is for Amara and I to make up the story together. I will make up part and let her fill in the blanks. It usually goes like this. And this goes on and on. The stories are always about a Princess and she always has long purple hair and pink eyes. This was before she discovered Star Wars. So the other night after I had told her the story I did this picture in Photoshop and gave it to her in the morning. She was SO excited! 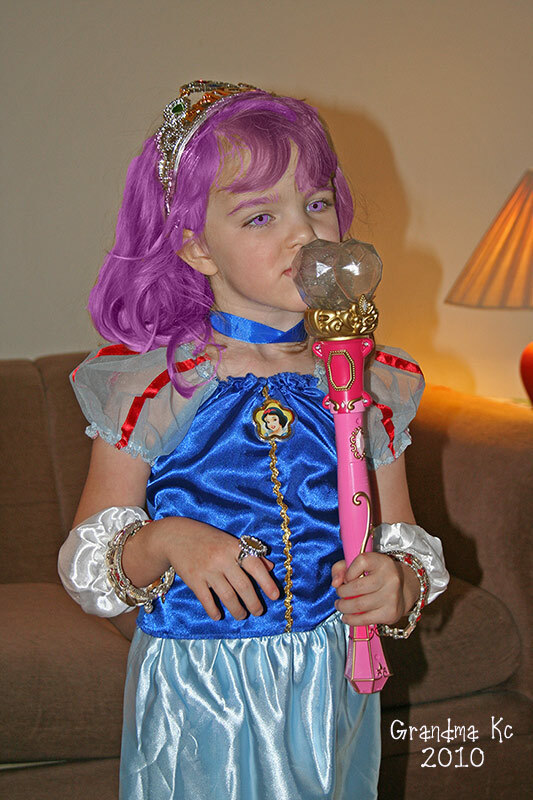 I had turned her into Princess Amara with the purple hair and pink eyes! It was a picture I had taken of her wearing her Snow White costume and playing with her Princess wand. So she took it home and tells her Mom “I think I should put it in a frame!” So her Mommy found her a frame and she carried the picture around all afternoon being so proud! Meanwhile back in reality, I set the picture back on the bookcase and Amara says to me “Grandma, did I have on a wig in that picture or did you make my hair purple? I love that girl and I love that the picture is still in a frame on the bookshelf. This memory was posted in Previously on Amara and tagged Amara, babysiting, camera, costumes, Grandma, Princesses, reading, Star Wars on June 22, 2010 by Grandma Kc. I’m pretty sure you’ve seen that picture before but I love that I can put it here now so that none of us will ever forget! YOU are the best baby sister anyone could ever ask for! Love you! Well hey, Grandma Kc, what about the hair????? She is certainly her Mother’s child when it comes to wanting purple hair! Her Mommy once had her hair streaked 16 different colors! Mommy also has contacts in about 6 different colors but none in pink — although I do think she has purple contacts! It is going to be so much fun to watch this child grow up! I love your Amara stories! I had to enlarge the photo just to check out the eyes. Love it! You are indeed the coolest grandma. And must be the coolest MOM, too, considering the multi-hued hair of Amara’s mom as a kiddo. Great story and photo! Thank you for linking to GRAND Social! Happy Monday to you! My granny always told us stories. It is one of my sweetest memories. I love that you make it interactive. Amara will always treasure those memories.